(Sugar Land, Texas, Nov. 8, 2017) - The Sugar Land Skeeters announced today that the club has signed Major League veteran Pete Incaviglia as manager for the 2018 season. 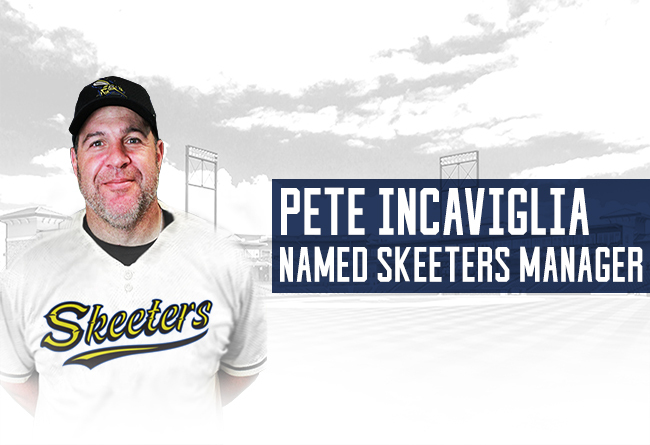 Incaviglia joins the Skeeters with 12 years of Major League experience and a total of 16 years in professional baseball. Pete was originally drafted by the San Francisco Giants in the 10th round in 1982 out of Monterey High School (Seaside, CA) and again by the Montreal Expos in the 1st round (8th overall) from Oklahoma State University in 1985. Over the span of three total seasons at Oklahoma State, Incaviglia hit 100 home runs over 213 games and had a career slugging percentage of .915, making him one of the greatest power hitters in college baseball history. After hitting .352 with 29 home runs and 103 RBI in his sophomore season, he would have one of the best seasons in college baseball history as a junior hitting .464 while setting single season NCAA Division I records with 48 home runs and 143 RBI in just 75 games. Pete would also lead Oklahoma State to the College World Series all three seasons. Incaviglia began his major league career with the Texas Rangers on April 8, 1986. In five seasons and 694 games with the Rangers, he racked up 604 hits with 124 home runs and 388 RBI. Following his five-year stint with the Rangers, Incaviglia would spend time with the Detroit Tigers (1991, 1998), Houston Astros (1992, 1998), Philadelphia Phillies (1993-94, 1996), Baltimore Orioles (1996-97), and New York Yankees (1997). Pete finished his professional baseball career in the Atlantic League, spending time with the Nashua Pride (2000), Newark Bears (2001) and with the Atlantic City Surf (2002). In addition to almost two decades of professional baseball experience as a player, Incaviglia also brings over a decade of coaching and managerial experience to the Skeeters, initially serving as hitting coach for the Detroit Tigers Class AA affiliate Erie Seawolves (2004-2006). He would then be named inaugural manager of the Grand Prairie AirHogs (American Association) the following year, where he led the club to the Southern Division Playoffs in 2008 and managed through 2010. In 2012 he was appointed manager of the Laredo Lemurs (American Association) where he would manage through 2016, leading the club to the Southern Division Playoffs in 2012 and 2014 and to a league championship in 2015.